The Athens of the first century was a shadow of its glorious past. The golden age of Athens was some 500 years before Paul visited the city, but it was nevertheless an impressive city. The emperors Augustus and Claudius both made generous donations to maintain public buildings and even Herod the Great donated statues to the city. Jews lived in Athens as early as the fourth century B.C. 2 Maccabees 6:1-2 refers to an Athenian senator sent by Antiochus IV Epiphanes to Jerusalem to persuade the Jews to give up on their traditions (Schnabel, 2:1174). Despite the reputation of the city, there is a certain amount of prejudice in Luke’s description of Athens. “All they do is sit around and talk philosophy all day!” (Acts 17:21). Even though this might have been respectable to some, Luke’s description of the philosophical activity seems negative. As for Paul, he is distressed by the idolatry of the city. Luke uses a phrase here which means something like “shaken in his spirit,” but can also mean “provoked to wrath”(παροξύνω, BDAG). In the LXX, both Hos 8:5 and Zech 10:3 use the word for God’s anger over the idolatry of his people (cf. PsSol 4:21). As a Jew, Paul was not just annoyed by the idolatry he saw, but increasingly angry! Yet Paul follows his usual ministry pattern, reasoning with people in the synagogue and in the marketplace. The synagogue and marketplace were the two places he thought he would meet groups interested in his gospel. In the marketplace, Paul encounters a group of philosophers who recognize Paul as presenting a new teaching. Luke specifically mentions Stoics and Epicureans, two popular philosophical traditions. Although the Stoics were a school of philosophy founded by Zeno of Citium (335-263 B.C. ), they continued to have an influence on Roman society in the middle of the first century. Seneca represents the Later Stoa, or Roman Stoicism. Seneca (A.D. 1-65) was born into an equestrian family and was the tutor of Nero until he was forced to commit suicide for allegedly plotting against the emperor. Because Seneca talks about God in very warm and personal terms some early Christian writers “adopted” Seneca (Tertullian referred to him as “always our Seneca” and at least one apocryphal tale was written concerning letters exchanged between Paul and Seneca. 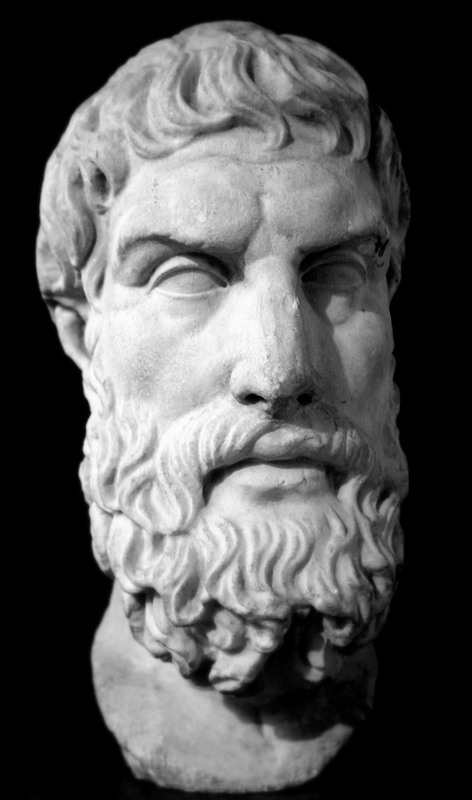 The Epicureans take their name from their founder, Epicurus (341-270 B.C.). He argued “good” was pleasure and the avoidance of pain, so a person ought to live their life in such a way as to seek the “good” – pleasure. His statement “It is not possible to live happily without living prudently, honorably, and justly” is remarkably close to the Judeo-Christian ethic, similar to Micah 6:8 in fact. Epicureans and Stoics were the chief rivals for the hearts of intellectual people in the Hellenistic age. Both emphasized a high level of moral values and both looked to the philosophical way of life the only way to be truly happy and content. And both have some affinity with early Christianity, but is it clear from Paul’s speech that Christianity is a rival to these two great philosophies? In what ways does Paul’s sermon create connections to Greek philosophy yet remain clearly distinct from them? In other words, how does Paul function in the “marketplace of ideas” the Greco-Roman world? Bibliography: Charles, J Daryl. “Engaging The (Neo) Pagan Mind: Paul’s Encounter With Athenian Culture As A Model For Cultural Apologetics (Acts 17:16-34).” Trinity Journal 16 (1995): 47-62. I personally looked at this passage with the idea that Paul was using scaffolding. He started out with a familiar concept and built on it. In this way the audience felt included but was also able to understand what Paul was trying to say. Paul was trying to put the gospel into some sort of context in order that the people could understand. I do not think he was promoting that particular philosophy but rather putting the gospel into an understandable context. He starts out by using the altars in Athens (v. 23) and he quotes the philosophers in verse 28. In both of these contexts he does not condone the activities of the Athenians but rather explains himself in light of these things using them as context not content. It’s interesting to look at Paul’s preaching methods and we’ve discussed a little in class about how differently they would be viewed today. In Paul’s sermon here we see him take aspects from both Stoicism and Epicureanism in order to convey points about Christianity. This is somewhat similar to his combining of two like-sounding phrases in scripture in order to make a point. It’s a little unorthodox, but it meets the people in their own culture and works off of what they already know. I feel like most of the stories in Acts go back to that concept. Paul used the Greek philosophy in the same way we might use some of the teachings of Mother Theresa. They promote good morals, and most people of this time know who she is, so it is a good way to say this is the type of way you should live. Paul uses these philosophies that everyone understands to make a point, and to shed light onto a subject that otherwise would be difficult to understand for people who have never heard the gospel or the scriptures. It makes sense that Paul would pull from the Greek philosophy when presenting the Gospel, especially the two that were named. The thing that I notice though, is that in the next few verses, he does a complete 180 and preaches only Jesus. What I see happening here is that he used something these people would understand and be able to connect with to help them grasp the idea, and then came straight out and told them what they need to do in order to be saved. So, as Sydney said above, it does come back to the idea of meeting people where they are, but once you have met them there, you need to show them exactly what they need to do. He seems to use somewhat of a Greek philosophical knowledge he had, to connect with his audience. In Acts 17:21 Luke says that “all the Athenians and the foreigners who lived there” were riveted when hearing what Paul had to share, because it was something new for their ears to hear. The message that Paul brought to the table was a new message that they were yet to understand. Verse 19-20 describe their thirst to understand more. When I think on this passage I begin to reflect on over-seas missions. It is crucial that you go into a new country with at least some kind of knowledge of the culture and people you are entering into. It would have been difficult for Paul to make a connection with these men, if he spoke solely in Jewish jargon. This passage then stands as an example to us as we embark on the mission of reaching the lost, to seek to understand who it is it we are addressing and what will get their minds going in order to respond to the message we share. Paul’s message to the people of Athens may have identified with many in its basic principles, but groups such as the stoics may have realized that taking on a belief in Jesus would have to change their thought process and lifestyle. The stoics were very focused on the importance of each individual being self sufficient (The book of the Acts, F.F. Bruce, 330). They were also so focused on having high amounts of dignity that they felt it was their duty to commit suicide if their life no longer held enough dignity. Some of their practices were also focused on breaking down barriers between classes and trying to make everyone equal in society. Although many of their practices were not necessarily bad or evil, deciding to follow Jesus would have to complete change their thought process and focus in life. This example of the stoics shows how difficult it must have been for Paul to share Jesus with the people at that time. There were so many different groups of people with an ingrained lifestyle that were not willing to even hear what Paul had to say. His work in beginning to spread the word of Jesus must have been incredibly difficult as he attempted to bridge gaps in culture and lifestyle. Passages like these show that these characters in the Bible are human just like you and me who face tremendous challenges and are put in situations that really test us in living out our faith. In Acts 17:16-21, Paul is put in a situation where he is getting annoyed with the idolatry that is taking place at the market place. I would assume explaining the idea of the importance of living your life according to good pleasure would be a aspect of life that God wants for us and wants to see us live out. I don’t know how much of Paul’s speech preached the idea of being a “rival philosophy”. A matter of fact, verse 17 says that he “reasoned with them” which had to have been a very polite gentle manner. This idea of “reasoning” I believe we can apply to our own lives when witnessing to Jews or Muslims as we can find common ground in our Old Testament prophets but then hopefully after they are listening and engaged, explain the aspect of God’s Grace and how that is so much better than the works aspects of those religions as it gives us an aspect of eternal joy than can lead to a good pleasurable, honoring life to the one true God. Passages like these show that these characters in the Bible are human just like you and me who face tremendous challenges and are put in situations that really test us in living out our faith. In Acts 17:16-21, Paul is put in a situation where he is getting annoyed with the idolatry that is taking place at the market place. I would assume explaining the idea of the importance of living your life according to good pleasure would be a aspect of life that God wants for us and wants to see us live out. I don’t know how much of Paul’s speech preached the idea of being a “rival philosophy”. A matter of fact, verse 17 says that he “reasoned with them” which had to have been a very polite gentle manner. This idea of “reasoning” I believe we can apply to our own lives when witnessing to people of other faiths as we can find common ground in our Old Testament prophets but then hopefully after they are listening and engaged, explain the aspect of God’s Grace and how that is so much better than the works aspects of those religions as it gives us an aspect of eternal joy than can lead to a good pleasurable, honoring life to the one true God. Paul, as you stated, is placed in a situation that he comes to wrath for the idolatry of the city of Athens who worship other God’s and philosophies of life. Paul in this state is preaching in the market and synagogues that Jesus Christ is the Lord, Redeemer, Savior of their lives. While doing so he sparks the interest of some students studying philosophy who listen and are intrigued in this new philosophy. Paul in his hot-headedness does what he does best and speak the truth in a radical way to these people. Paul is firm and rooted in what believes of Christ and strives to bring and enlighten these young men to follow and believe in the teachings of Christ. As you Troy eludes to the idea that we as Christians have to speak and share Christ to others who are willing to listen. Thus, those who are willing to listen will hear the good news while those who seek nothing will not here. Upon reading this blog I couldn’t help to think about the parallels I found with my Philosophy class. We have touched on various forms of philosophy and it is so cool to see how accurate the Bible is along with the history of Philosophy. This passage in Acts 17:16-21 shows the development of the individuals who wanted to seek more understanding of the world and humans and would sit around discussing as stated in Acts 17:21. Athens was a city filled with people who sought to learn and understand more about the world, yet they were so mixed up with the distractions of idolatry and a pagan culture. Paul is so upset with these people who are just so confused and are desperately seeking the “good life” but not finding the actual true source of life fulfilment. Paul is trying to “reason with them” making them see the error of their thinking and find the real answer to life! If you have ever stepped into a culture unlike your own you would feel the same. I remember going for the 7th time on a mission’s trip to the indigenous tribes of Costa Rica and seeing no change in the people who we had taught to many things too. They were still worshiping nature instead of the Creator despite those who said they understood and believed. I can only imagine the frustration of Paul upon finding people so confused to the real truth. We can take this as a real challenge to not give up on people. Everyone is at a different level and we need to patiently reason with the people until they truly understand! From reading the passage and your post It does not seem like the philosophers are really competing with Paul at all. I think they are probably use to people coming in and presenting new ideas, so it could not really have a threatening nature in their minds. Which is what spurs them to ask Paul more after they hear him apparently “babbling” in verse 19. It is not until verse 24 that Paul solidifies his preaching as a challenge against their society. And I believe that it is because of the reasonable and sensible argument that he makes that some of them are open to continue listening to his preaching. Paul showed us an example of sharing the Gospel in a way that was incredibly effective for his listeners. And I would say that he fits into the marketplace of ideas in the Greek world just fine because of their drive to find the best way to live life. They sit around talking all day about which Gods are best and which way is better to live, and Paul delivers and reasonable introduction to that answer, enough to peak their interest.